You have a good maintenance program, but you are learning not all tire inflations systems are created equal. Until now you have had your people try and catch trailers in the inspection lanes, but how do solve the problem when your trailer stays out for months at a time. The T-RAC, all pneumatic system can and will do just that. You set the desired tire pressure and it is consistently maintained. At a glance, your drivers are able to verify tire pressure in all tires; each tire has its own pressure gauge. T-RAC not only maintains your tires at the desired pressures, BUT when the tire heats up and the pressure rises from friction, highway speeds and temperature. 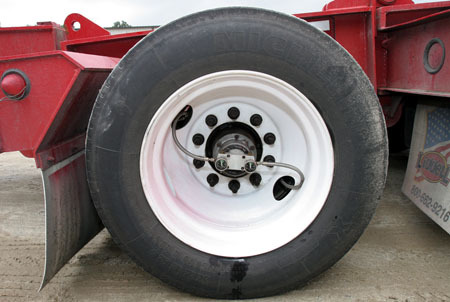 Over pressurized tires are corrected by preset pressure relief valves. The result is a more uniform tread wear and considerably longer tire life. Now that’s smart! !